As far back as I can remember I have always had a fascination with science and it’s ability to illuminate the mysteries of the natural world. It’s no surprise I became a chemical engineer. A field positioned at the interface of the intricacies of atomic and molecular behaviour and application to everyday real life challenges. Science is well poised to meet these challenges and has demonstrated that through its innovations and technology. I think it this success that has placed science on the pedestal of knowledge in our current generation. This success has breathed an unfortunate air of arrogance into such a humble servant of curiosity. It has become the hand maiden used in pursuing ideologies. This is nothing new however. Africa could tell you a thing or two about how science had been used to shape ideologies. Anthropology was a field that presented “scientific evidence” that the African was closer to the ape than to Western man. On that basis colonization was a rightful and justified duty because the African it had been shown was not fully rational man. This is what possibly happens when science over steps it’s limits. So what exactly is science? Richard Feynman in his famous MIT lectures gives a wonderful description of what science is. 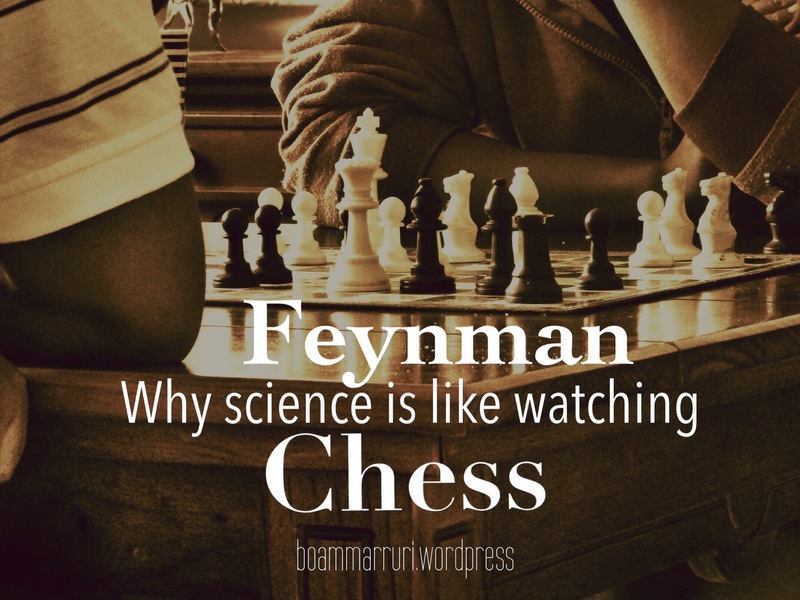 He says scientists are like spectators watching a game of chess trying to figure out the rules that the pieces obey. With enough observations the spectators uncover that certain pieces behave according to certain rules : the bishop moves diagonally; the rook moves vertically and the queen has free movement in any direction. The spectators through numerous observations are able to figure out the rules the pieces obey, however they cannot explain why the pieces are there, why there is a board or why the rules are the way that they are. The board is the space-time dimension where matter and energy exist and the rules are the fundamental laws of physics that govern the behaviour of matter within space-time. The scientist’s task is to simply uncover the fundamental rules that matter and energy follow, however to answer why matter and energy exist at all, why there is a space- time dimension, and why there are fundamental rules at all – is not a task for the scientist. So questions about the origin of the universe, why there are fundamental laws at all, are questions science can not fully answer. Why would I say this? Because the origin of the universe was an event. The origin of life was an event. Science is at its most successful when it is explaining fundamental laws based on repeatable observations and experiments and not events. The origin of the universe is simply not a repeatable observation and therefore puts science at a handicap in explaining it. This is why Stephen Hawkins resorts to circular reasoning when he says because there is a law of gravity the universe can and will create itself. But the problem is that the laws cannot exist without the universe already existing, the laws don’t have causal powers but merely describe the ordered behaviour of the universe. So how could the laws then create the universe, if the universe first had to be in existence in order for there be laws to describe the universe. It would be like saying because there is a rule of castling, chess pieces can create themselves. Rules simply explain why the pieces behave as they do. Why is science then pushed to these limits, to answer questions it was never meant to answer? It is because the naturalist realises that if science is incapable of answering the basic questions of reality – the secular mind must then admit that his naturalistic and secular world view is not held on the basis of rationality or science. But rather a leap and a priori commitment into the dark and unknowable that the physical world is ultimate reality. Next Next post: In a secular world without absolutes: What does it mean to change the world?